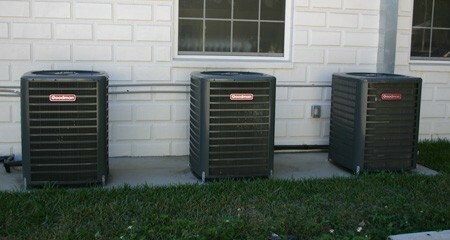 Having a central air conditioning system installed is a big step. It’s just about essential, though, with the type of climate we have here in the Zephyrhills and Dade City area. When you do decide to go with a central air conditioning system, you’ll need to figure out exactly what type of system is right for your home. This can be pretty confusing with all of the different products out there. But here at Bahr’s Propane and Air Conditioning, we’re committed to helping you find the product that’s just right for you. Many of our air conditioning systems are available as combination air conditioning and heat pumps too, giving you a climate controlled home environment year–round. Bahr’s expert technicians have extensive experience working with many types of air conditioning units. We offer both residential and commercial installations, and no job is too big or too small. Whether you need an air conditioning system installed in a new construction office building or you simply want to replace the existing unit in your home, we’ve got you covered. In addition to AC installation services, Bahr’s also offers both commercial and residential diagnostic services. If you’re currently having problems, we’ll be happy to come out and take a look at your system. Even if we didn’t install it, our technicians have the skills and experience to perform all manner of repairs on a wide variety of air conditioning equipment. We install quite a few different brands of air conditioning systems. This gives you some options when you’re trying to select a system and we’ll be happy to help you find the right one. Whether you opt for Amana, Goodman, Tempstar, Frigidaire or one of our other great brands, you can rest assured that you’re getting a quality product installed the right way the first time. In addition to entire air conditioning systems, we offer many other related products. These include surge protectors, ultra violet lights, filters, de–humidistats, thermostats, contactors, breakers, transformers and power relays. Of course, we don’t just install air conditioning systems. We maintain them too. Bahr’s actually offers an excellent maintenance program that can help keep your energy bills down and your system running at peak efficiency for years to come. With our Maintenance Program, you’ll get a 39–point inspection, a coil cleaning, and special discounts on parts and certain services. The prices for the maintenance program differs in relation to the type of system you have in place. However, even the most expensive option is well worth it in the end. The amount you’ll save in energy and repair costs over time will more than make up for the small maintenance service fee. Plus, you’ll have the peace of mind that comes from knowing your system will function properly whenever you need it. Choosing to go with Bahr’s for all of your air conditioning needs also guarantees you a superior customer service experience. We are a family owned business and we know that we wouldn’t still be operating if it wasn’t for satisfied customers like you. Because of this, we strive to always provide the best possible service in the friendliest manner possible. We hold all of our employees to this high standard as well, helping to ensure that every interaction you have with our company will be a positive one.